Kwanzaa is a time for reconnecting with family, friends and community, and a Kwanzaa party is a great way to do just that. 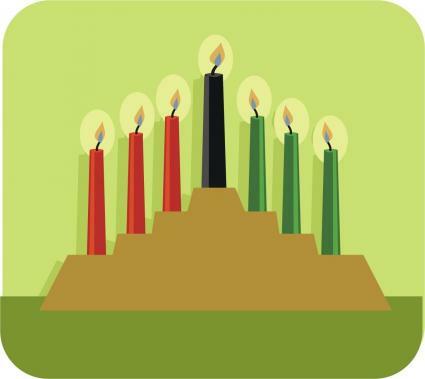 There are several ways to honor the spirit of Kwanzaa throughout the entire seven day celebration. The colors of Kwanzaa are black, red and green. The symbolism of the colors were assigned by Marcus Garvey; black is for the people, red is for the struggle, and green is for the future and the hope that comes from the struggle. Contrary to popular belief, Kwanzaa is not a substitute for Christmas or any other religious ceremony. It can, however, offer a substitute for European cultural images of Christmas, like Santa Claus. Over the course of Kwanzaa, seven candles are lit. There should be one black candle, which is lit the first night, and three red candles, plus three green candles which are lit on successive nights. The candles stand in a single candle holder, with the black in the center, and the red on the left and green on the right. After the black candle is lit, a new candle is lit every subsequent night, moving from left to right. Each candle has a meaning that corresponds to the Nguzo Saba. You can have a small ceremony each evening to light the day's candle, during which you pause to reflect on the candle's meaning. Consider encouraging your guests to bring traditional African stories or poems that are relevant to that day's principle. Alternatively, you can have a candle lighting party for the first night or the last night of Kwanzaa, during which you can have traditional African music and storytelling. Ujima is the principle of collective work and responsibility, and you can honor this principle in a fun way with an Ujima party. Have a group of family and friends over to prepare a meal. Encourage each person to contribute a recipe or ingredient for the meal. Cook the meal together, and distribute the food to less fortunate members of the community, or take the time to share the meal with elderly or lonely people in your neighborhood. Gifts are traditionally given to children during Kwanzaa, and custom dictates that each gift must be accompanied by a book and an ancestral symbol. Instead of buying new books, invite the children in your circle of family and friends to choose one of their favorite books and present it as a gift to one of the other children. Even better, encourage older children to write a short "book" about their family or some part of African heritage, illustrate it, and present it as a gift. Adults can get in on the action as well, creating their own books for the children. A Kwanzaa party should offer a chance for reflection and togetherness, while eschewing the commercialism that's so prevalent during this time of year. It can also be a wonderful way for people of African heritage to celebrate their culture. If you choose to take part in Kwanzaa, make this quiet time a memorable week-long occasion with your family and friends.